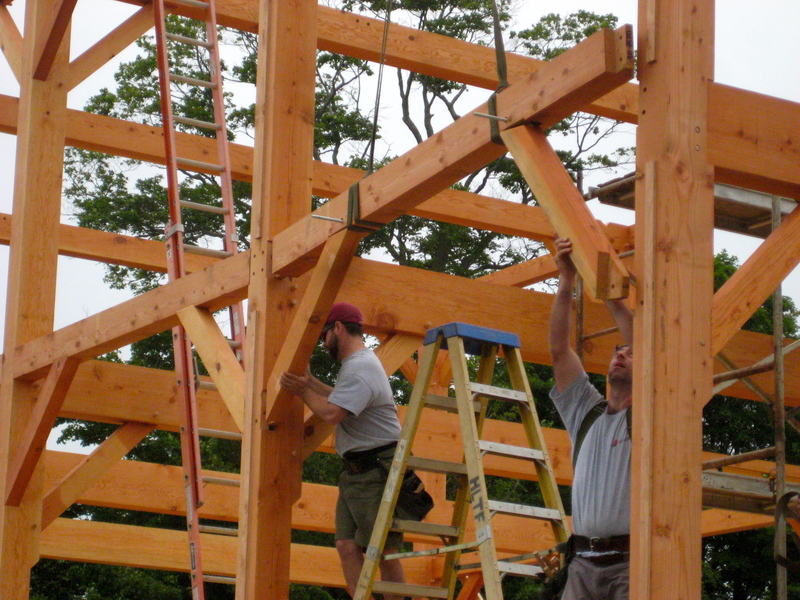 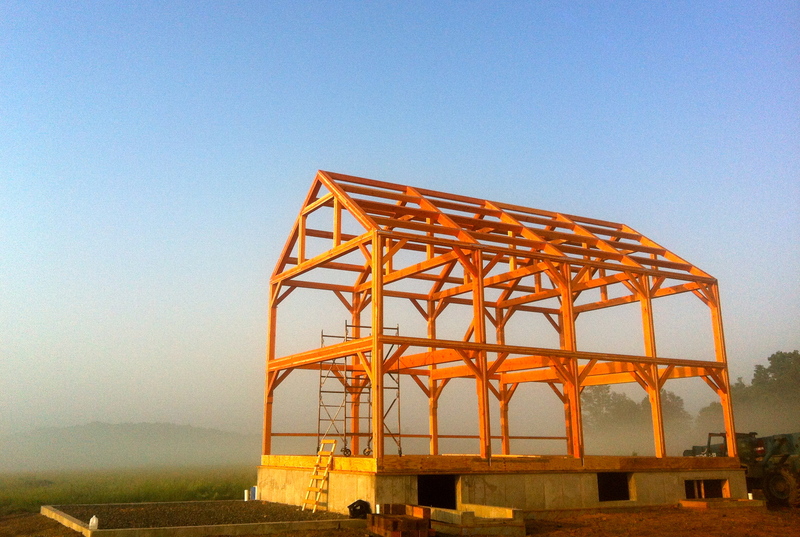 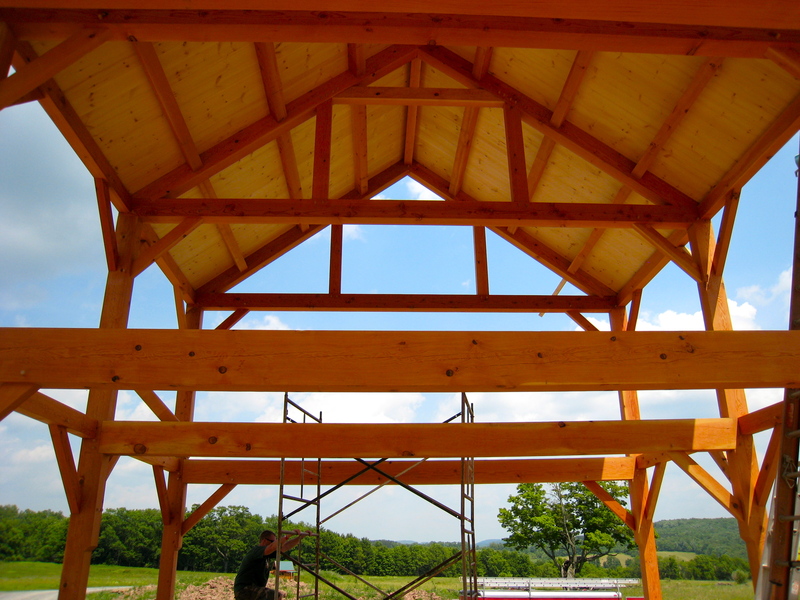 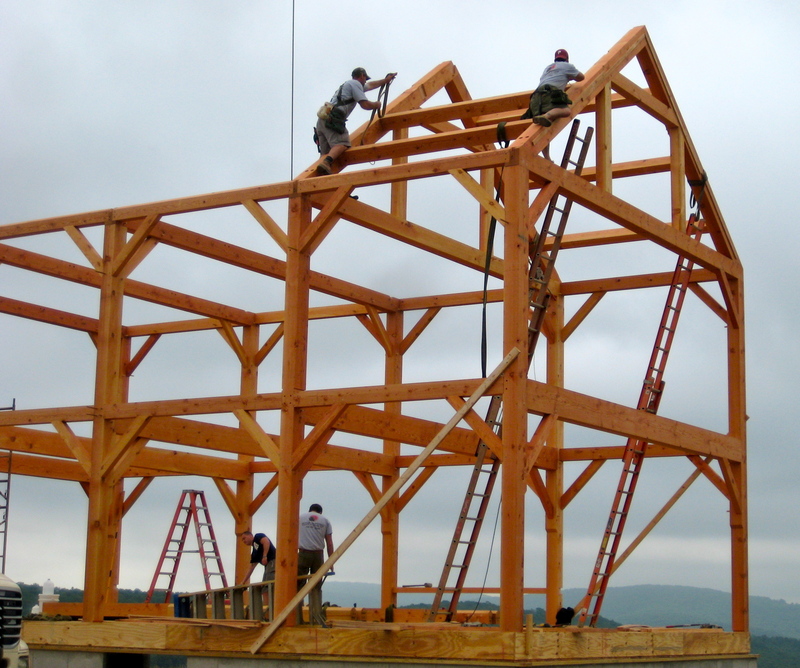 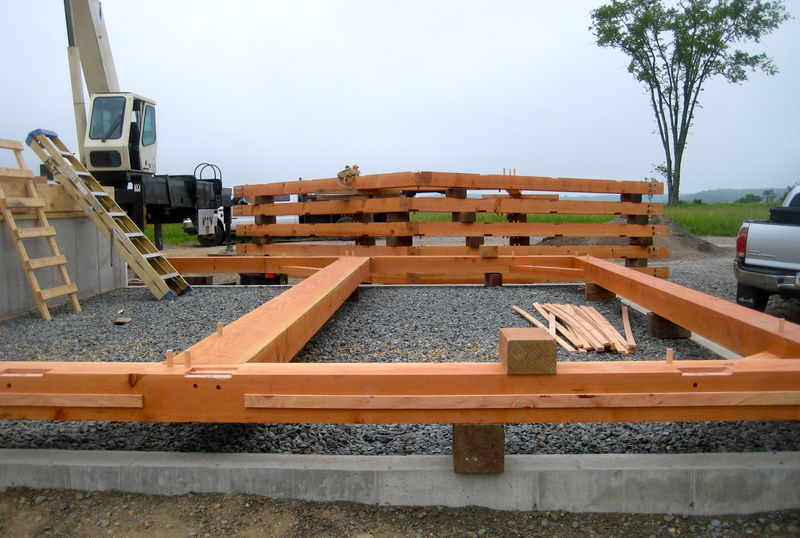 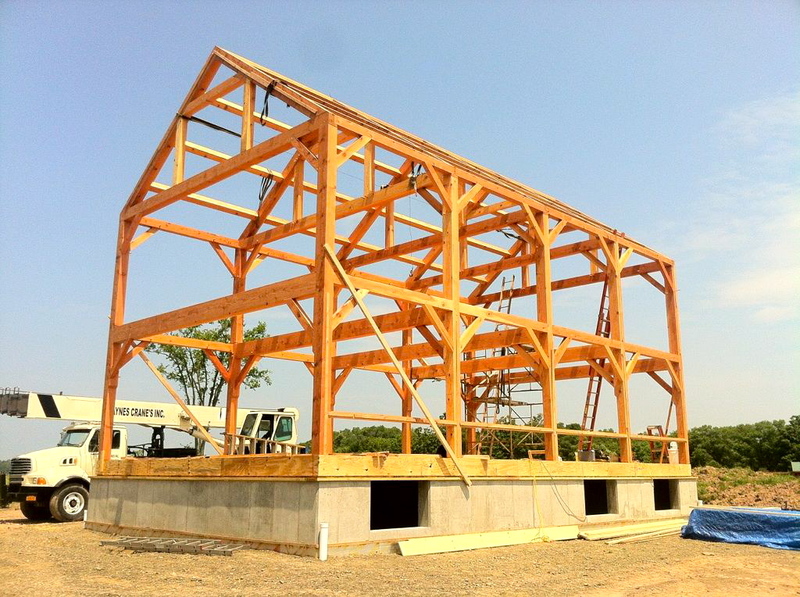 Catskills Timber Frame - Hugh Lofting Timber Framing Inc. 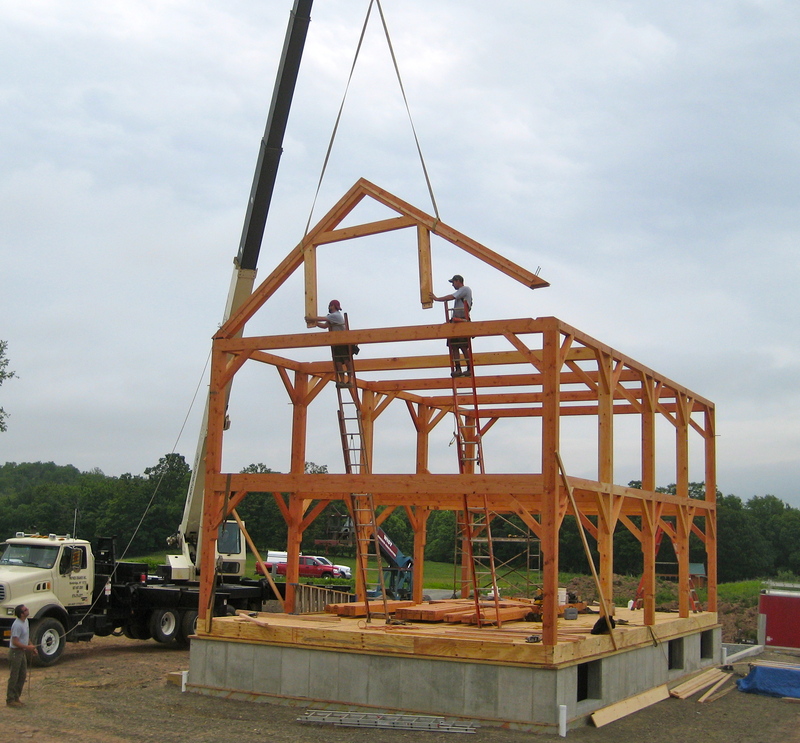 The HLTF crew traveled to upstate New York to raise a new timber framed vacation home last week. 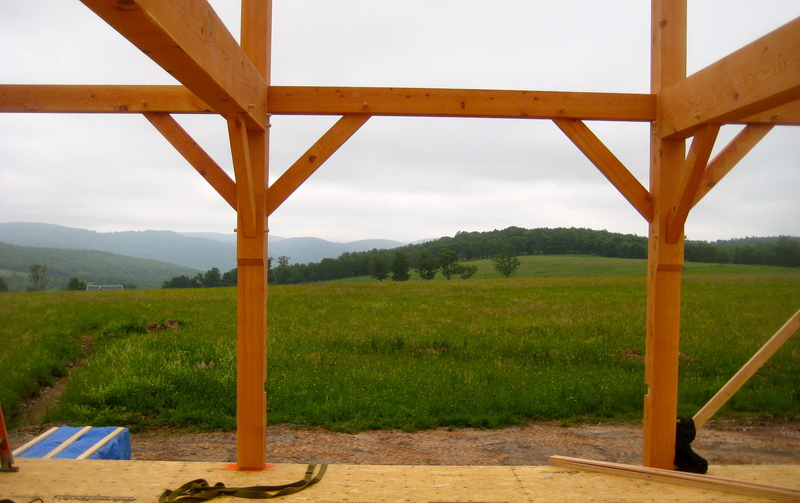 The frame was hand crafted from kiln dried Douglas Fir in our shop in Kennett Square, PA. 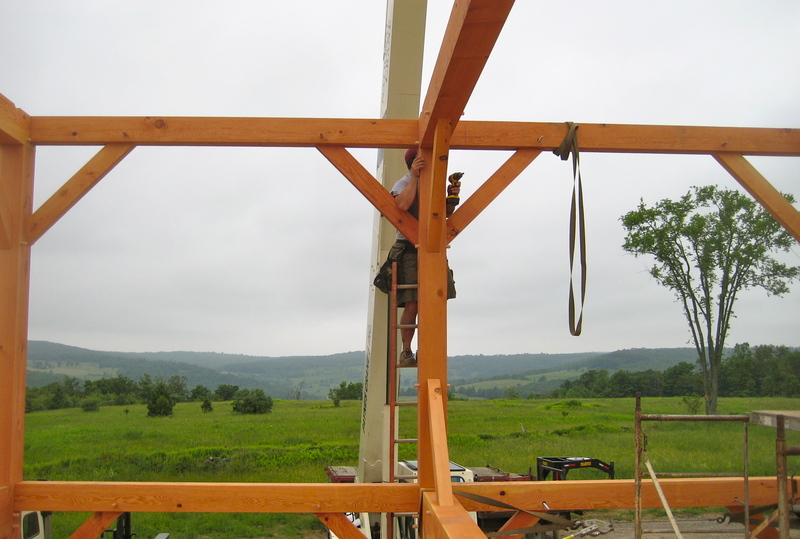 The frame was cut, pre-fit then stained with Land Ark. 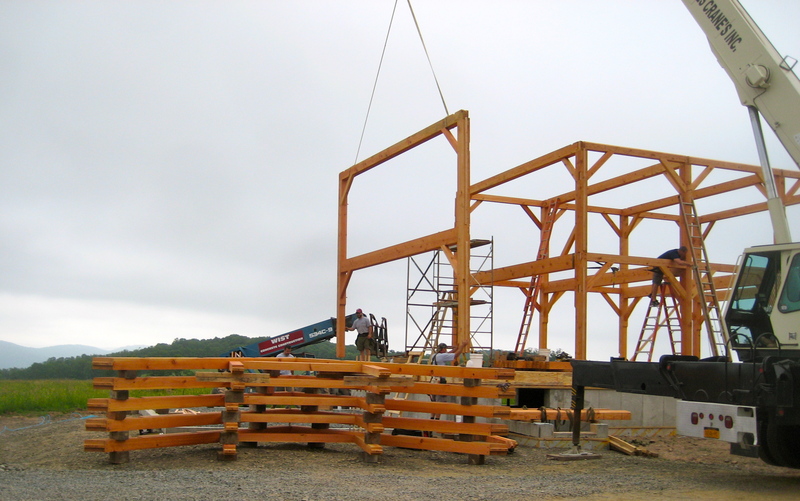 HLTF worked closely with scan-design, an architectural firm in Philadelphia, on this project. 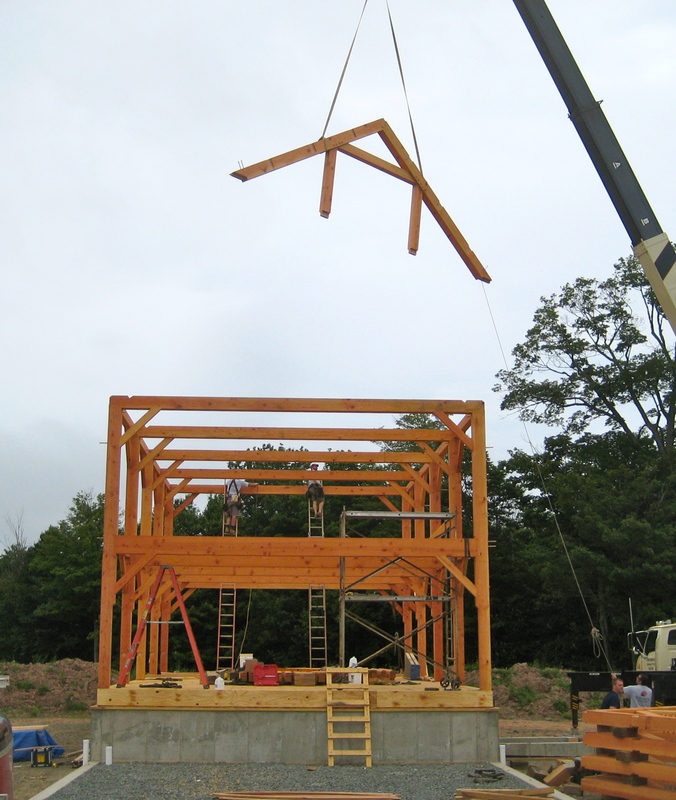 The crew assembled the bents on the ground and then flew them into place with a crane. 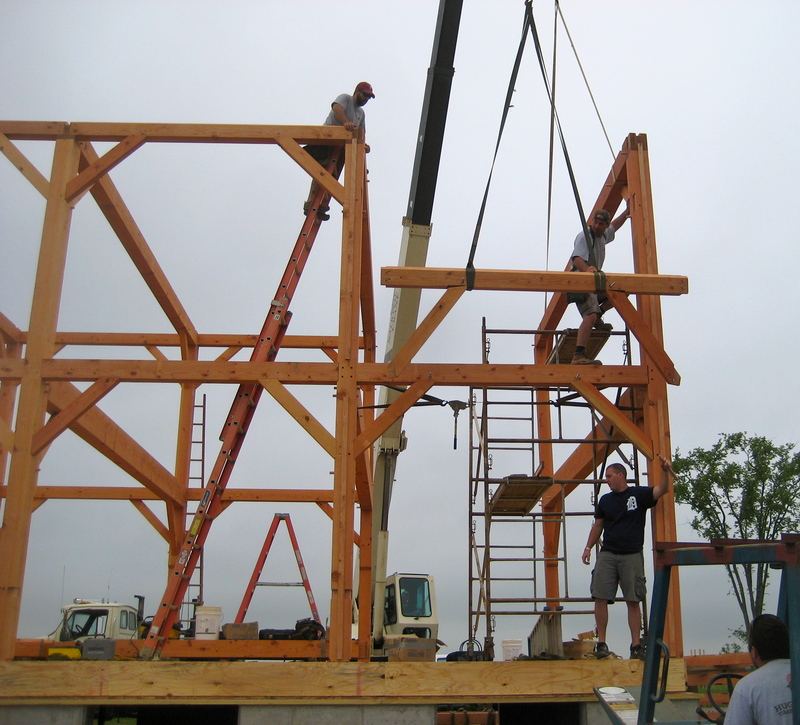 Once they had these in place and temporarily braced, the bay girts were placed with the help of a lift. 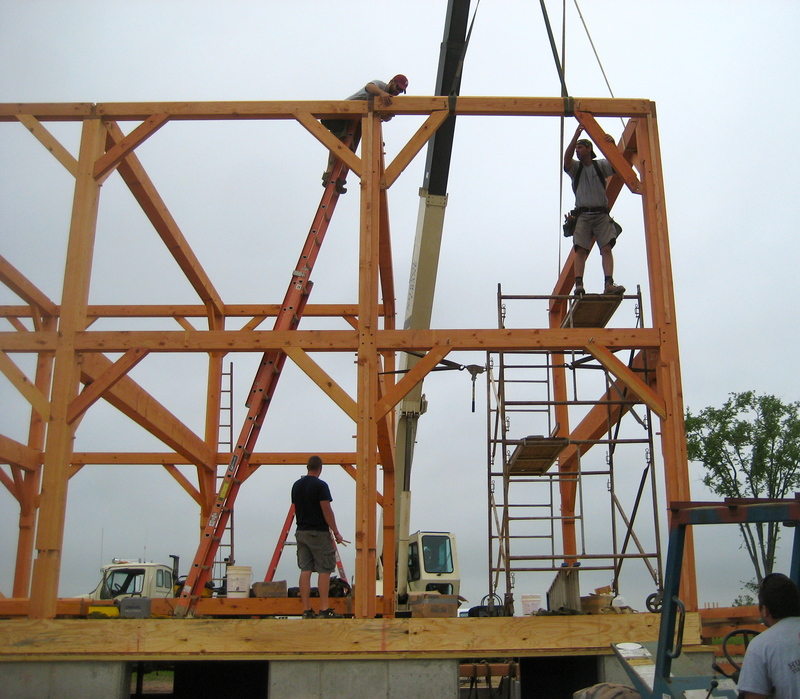 This process is repeated on the second level. 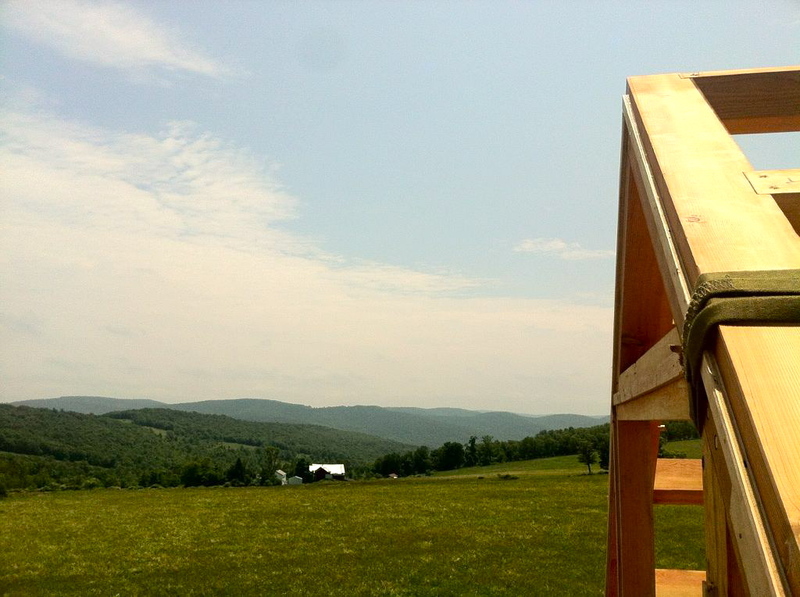 Check out these great shots from one of our crew that he took from atop of the frame. 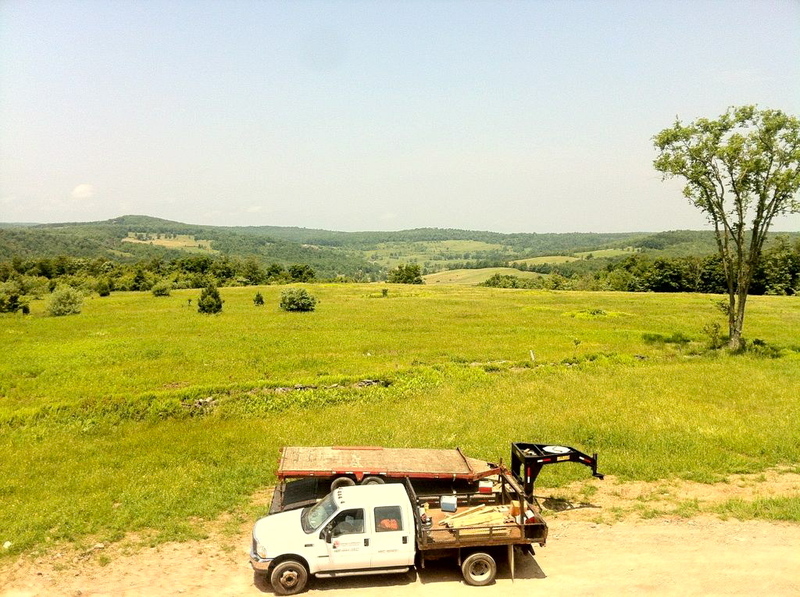 The mountaintop job site is breathtaking. 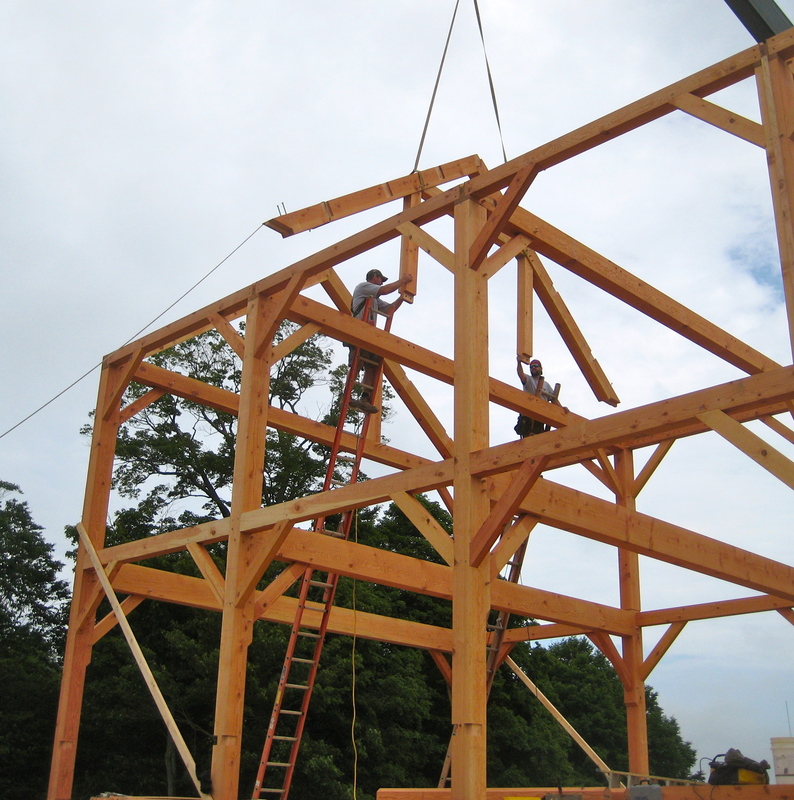 The crew also flew the pre-assembled roof trusses into place with the crane. 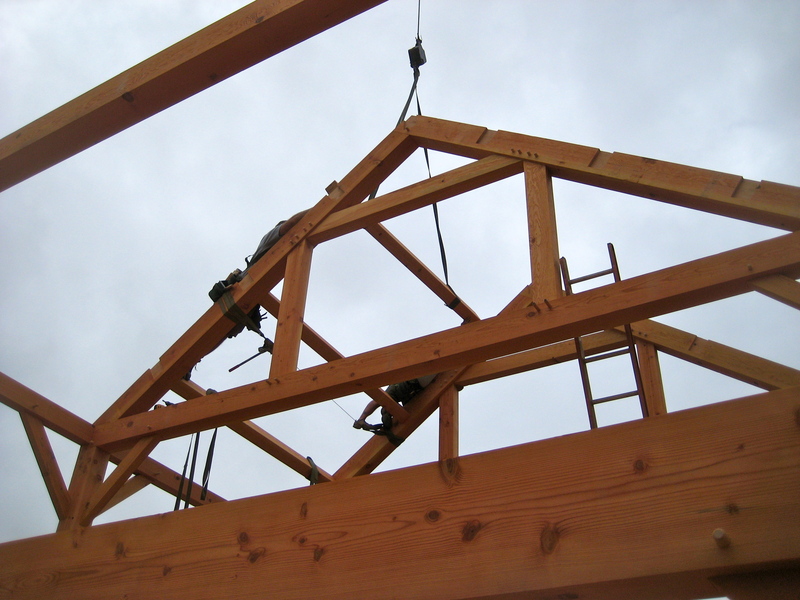 After the super structure of bents and wall connectors were raised, the crew set the roof purlins, which span between bents. 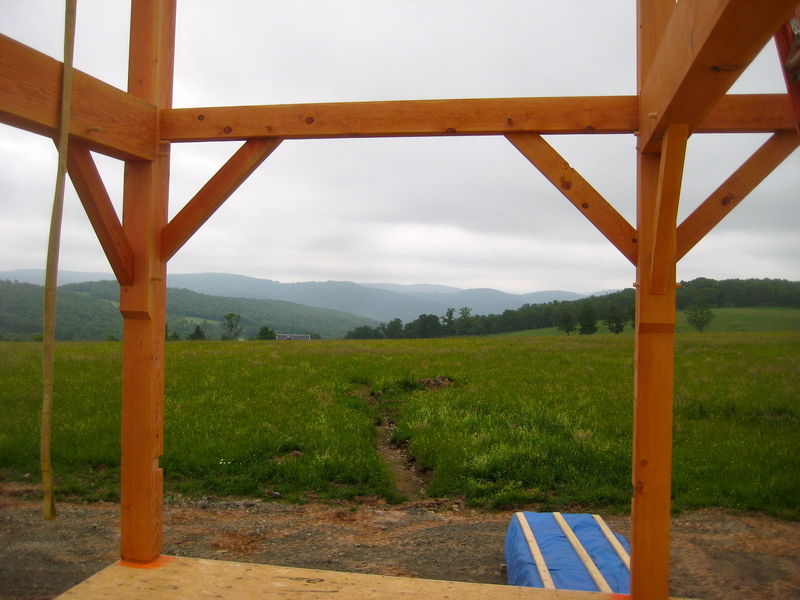 This contemporary home features continuous glass at the South wall, which will frame the gorgeous views of the mountaintop location. 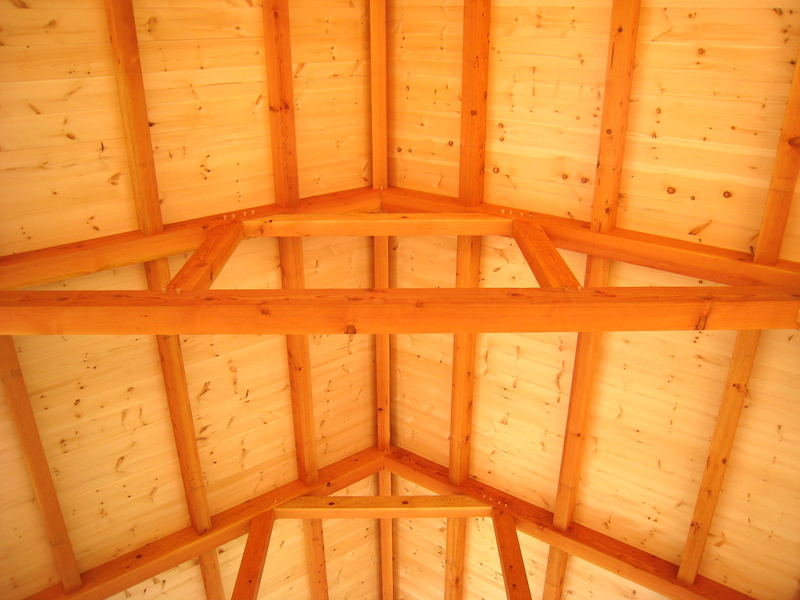 The roof decking is 1×10 Eastern White Pine, which the client wanted to remain unfinished. 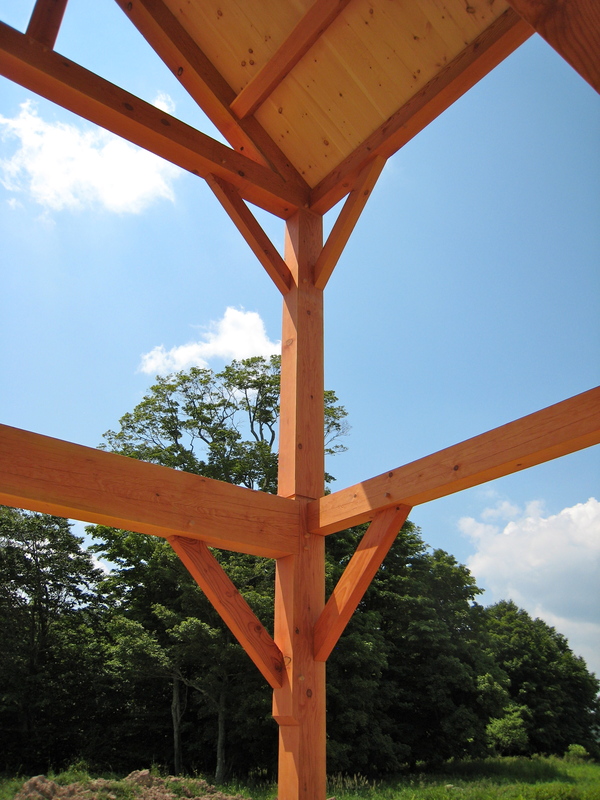 The unfinished White Pine decking beautifully highlights the Douglas Fir frame. 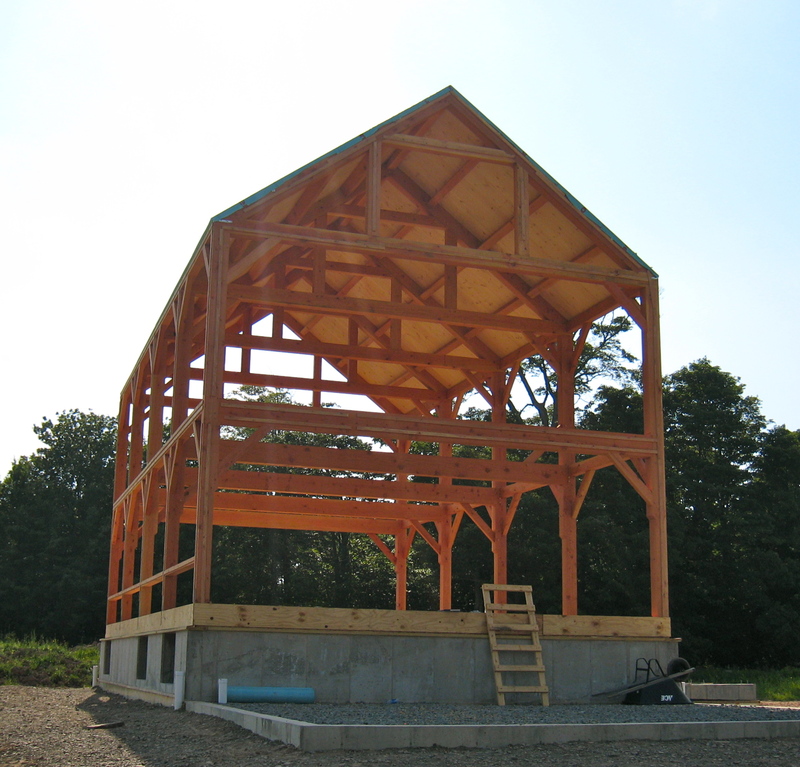 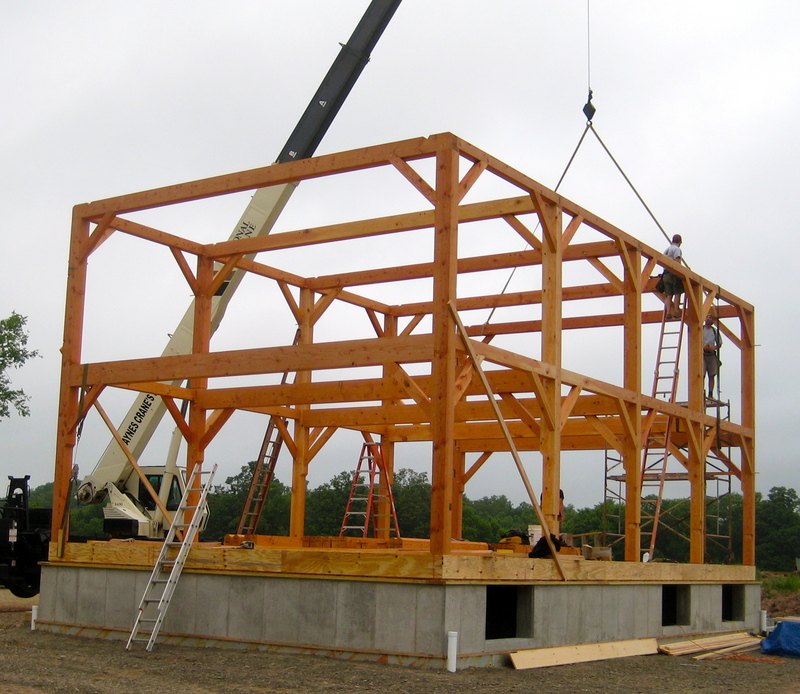 The timber frame provides the structure for the super insulated SIP building shell. 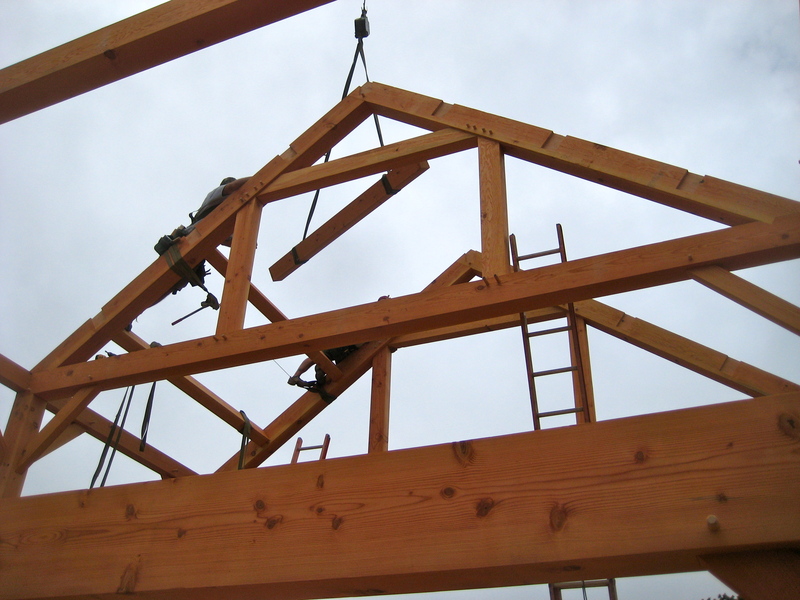 The roof SIP’s have an R-40 and the wall SIP’s have an R-26. 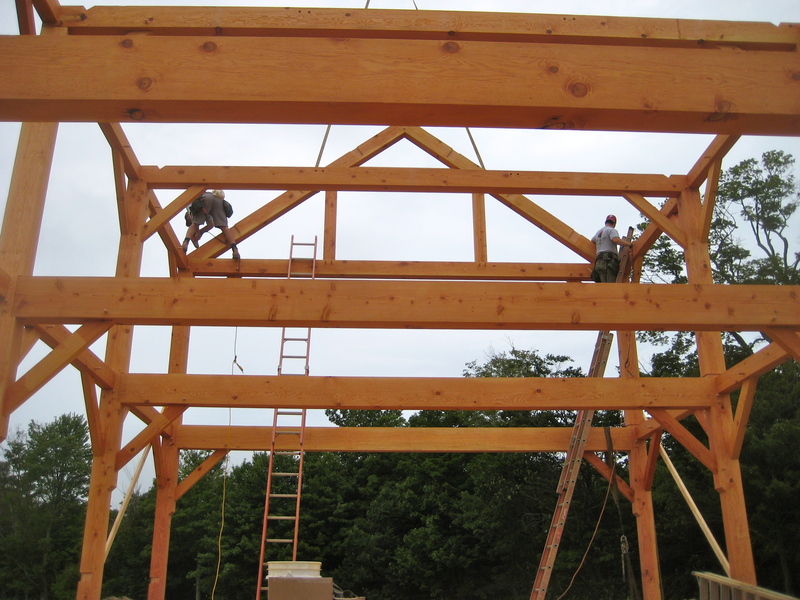 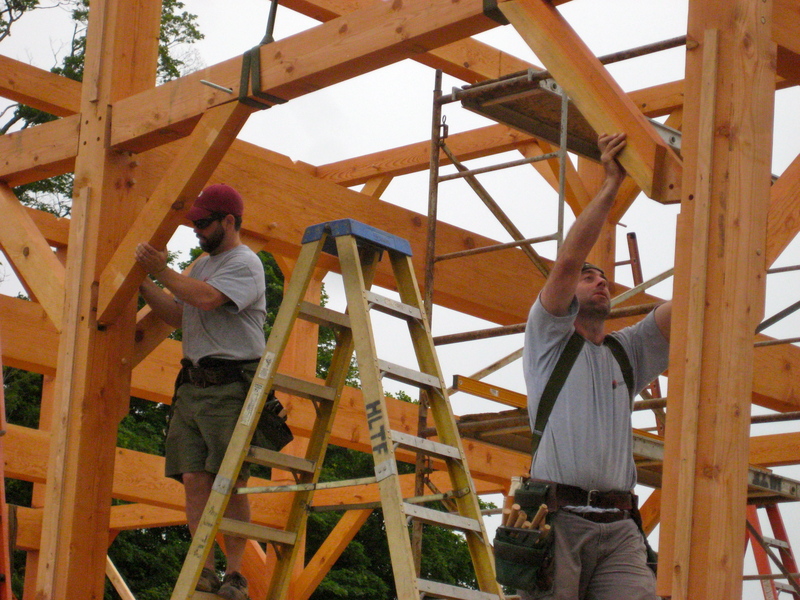 Check back for future updates on the Catskills Timber Frame.